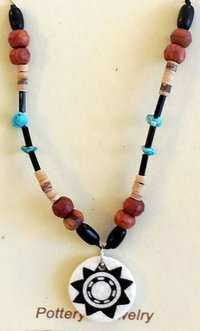 This necklace features the iconic Mesa Verde Museum Association logo which was adopted from an Ancestral Puebloan Black-on-White bowl currently on display in the Mesa Verde Visitor's Center. 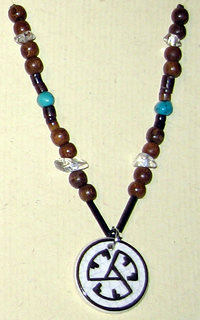 18" black, twisted cord necklace with ceramic pendant. 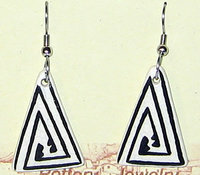 Handcrafted by Designs by Anna™ in Durango, Colorado. 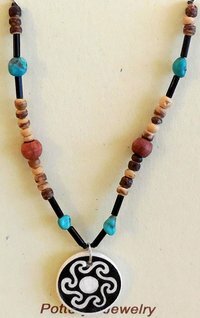 This necklace features the iconic Mesa Verde Museum Association logo which was adopted from an Ancestral Puebloan Black-on-White bowl currently on display in the Mesa Verde Visitor's Center. 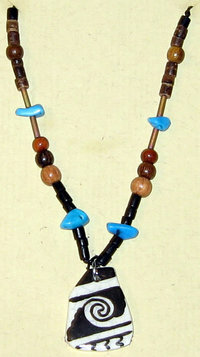 18" necklace with turquoise, stone and wooden beads and, ceramic pendant. 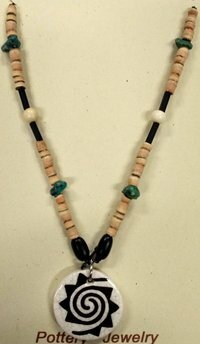 Each necklace is unique with variations in bead color, style, and placement. 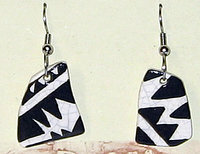 This pendant design was inspired by pottery fragments called "sherds" dated A.D. 500-1300. There is evidence which suggests that sherds, bone fragments, and shells were used by the Ancestral Puebloans to make game pieces and jewelry. 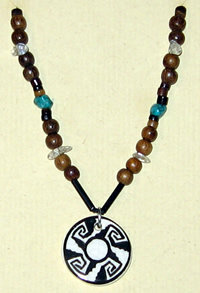 The design of this pendant was inspired by a Cortez Black-on-White bowl, dated A.D. 900-1050. 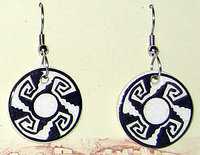 This sunflower design was inspired by a Mancos Black-on-White bowl, dated A.D. 900-1150. 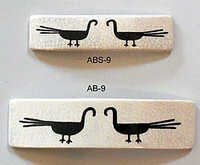 Beginning around 700 A.D. the Ancestral Pueblo people of Mesa Verde began making elaborate black-on-white pottery, on which they painted intricate geometric patterns with yucca fiber brushes. 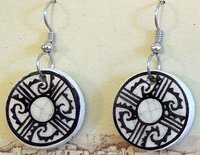 This handcrafted earthenware ceramic jewelry was inspired by the beautiful pots made by the Ancestral Puebloans of the Southwest.